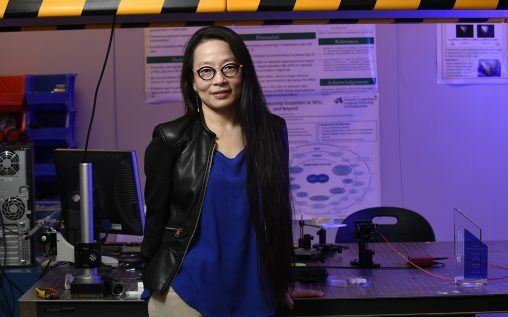 Wright State professor Caroline Cao is an expert in the design and evaluation of enabling technology, such as haptics, navigational aids, and surgical simulation, for minimally invasive surgery. Sardined into a boat on the South China Sea with other refugees fleeing post-war Vietnam was 11-year-old Caroline Cao. The voyage of “boat people” was part of a tidal surge of refugees leaving the Communist-controlled country in the late 1970s. The exodus came in the wake of economic hardship and the threat of being sent to re-education camps, where hard labor and possible torture, starvation, and disease waited. Many of the boat people did not survive their passage because of pirates, overcrowded conditions, and storms. Cao and her family were among the lucky ones, but her experience on the boat left its mark. Her family made it to the Philippines and were then resettled in Vancouver, Canada, where Cao spent her teenage years. That sense of responsibility and seriousness of purpose has catapulted the 51-year-old Cao to a career as a medical pioneer and into the upper reaches of higher education at Wright State. She is a professor of surgery in the Boonshoft School of Medicine and a professor of biomedical, industrial, and human factors engineering, as well as mechanical and materials engineering in the College of Engineering and Computer Science. Cao was the Ohio Research Scholar for the Ohio Imaging Research and Innovation Network from 2012 to 2015 and is an expert in the design and evaluation of enabling technology — such as haptics, navigational aids, and surgical simulation — for minimally invasive surgery. In 2018, she graduated from the prestigious Executive Leadership for Academic Women in Technology and Engineering (ELATE) program hosted by Drexel University in Philadelphia, where she worked on ways to build an ecosystem for entrepreneurship at Wright State. Cao said the presence of women leaders in STEM fields is still lagging behind what she thought it would be right now. Cao refers to women in top STEM leadership positions as “unicorns,” because they are rare and stand out. Cao herself has fought her way to the top of her field. When she was a young college student at Simon Fraser University in Vancouver, her father suffered a brain aneurysm that left him in a coma and later on the road to rehabilitation. It was a pivotal moment for Cao. She suddenly became interested in health care and how to help people regain their motor skills. She also began to understand what it took for people with disabilities to navigate and adapt to their environment every day. After graduating with a bachelor’s degree in biochemistry and a master’s in kinesiology, Cao went to the University of Toronto, where in 2002 she earned her Ph.D. in mechanical and industrial engineering. Then she joined the faculty at Tufts University near Boston, where she was director of the human factors program and conducted research in the emerging area of minimally invasive surgery. She won the prestigious National Science Foundation CAREER award in 2003 and served as principal investigator or co-principal investigator on more than $15 million of funded research, including multi-institutional grants supported by the National Institutes of Health. The field of human factors engineering is applying the understanding of human capability in the design and development of technology and other systems to improve performance and safety. Specifically, Cao is an expert in training physicians in the use of imaging and robotics to do minimally invasive surgery. Cao is currently conducting research into how trust affects the adoption of surgical robotic systems. She is surveying surgeons, physicians, and patients to gauge their trust in robotic surgery. Cao joined the faculty at Wright State in 2012, attracted by the opportunities created by the Ohio Third Frontier, a state initiative designed to transform Ohio’s economy through the accelerated growth of diverse startup technology companies. In 2017, Cao was awarded a prestigious Fulbright Scholar fellowship to share her skills and knowledge with college students and faculty in her native Vietnam. She spent a semester working with students and faculty in the Department of Biomedical Engineering at the International University of Vietnam National Universities in Ho Chi Minh City, giving lectures on human factors engineering and her research in minimally invasive surgery. She also helped with the restructuring of their entrepreneurship program. Last year, Cao was among 26 faculty members selected for the ELATE program. The women leaders in academic STEM fields hailed from institutions such as the Mayo Clinic, Purdue University, the Georgia Institute of Technology, Carnegie Mellon University, the University of Michigan, and The University of Texas. Cao says women who aspire to leadership positions in STEM fields have to have a certain quality. “They have to be persistent,” she said.